Using Your Radar Doesn't Have to be Complicated! 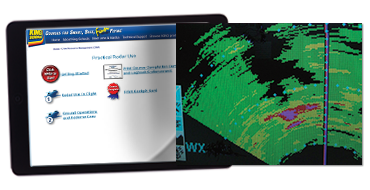 When you finish this course in basic radar use, you will feel that radar is simple to understand and easy to use. We guarantee that you'll learn how to use your radar effectively in just one to two hours. Helps you meet training requirements for Part 91K, paragraph 91.1065(a)(2) and (7), FAR 125.287(7) and (8), and FAR 135.345(b)(5) and (6). The course also includes a downloadable Radar Operations Cockpit Card. Satisfies IS-BAO recurrent training requirements. $965 $482 ... 50% off! $1561 $779 ... 50% off! What devices will the course work on? How long can I access the material once I complete the course? The Jet Transition course, which is listed in the selection of KING Pro Course below, has lifetime course access; the other courses on this list have a 90 day review period once you have answered the last question in the course. How long are the pro courses? Crew Resource Management (CRM) contains approximately two (2) hours of instructional material. Are these courses FAA approved? The following courses cover all FAA required general topics for all operators. On select courses(*), each operator needs to supplement our course with aircraft and/or company specific items from your ops spec to obtain your POI’s approval to use the course in your training program. Jet Transition is designed to provide an overview of jet aircraft operations. We have found that most FSDOs are familiar with our training but if yours is not, you can provide them with a copy of any course syllabus by downloading it from our site before you purchase a course. Additionally, if there are still any concerns, we will provide FAA inspectors with a course key for any courses you are considering at no charge to you or the FAA for them to review. The only requirement for the complementary course is that it must be sent to an FAA e-mail address. How often do I need to renew my RVSM? If you are flying under Part 91 – You need to check whether the insurance company or company you are flying for has a required renewal timeframe. (The FAA does not have a specific time indicated for renewals.) There is no FAR that sets a requirement for RVSM Recurrency for Part 91 operations. Under the LOA, the FAA expects that the person designated as the responsible individual will ensure that all pilots are qualified to operate the aircraft. Depending on the relationship with your POI you may or may not have training requirements specified in your agreement or operations manual. The primary driver is more likely company policy, personal standards or insurance considerations. LOAs used to expire after 24 months and again it was between the operator and the POI what was required to renew the LOA. LOAs are aircraft (tail number) specific and now must be renewed only when any one of three things happen: (1) change of equipment, (2) change of ownership, and (3) change of responsible individual. Again, it will be between you and the POI as to what will be required to issue a new LOA if any of those things change. If you are flying under Part 135 – You need to check with your Chief Pilot and Training Manual as the renewal time may vary. Can my flight department receive a volume discount? Yes, King Schools does offer volume discounts for qualified flight departments. Please contact us at 800-854-1001 or +1-858-541-2200 for pricing or to place your order. Do you offer any kind of course progress reporting for larger flight departments? Yes we do! Please contact Bill Ziska, VP of Sales for King Schools at +1-858-576-6214 and let him know that your flight department is interested in setting-up weekly reporting. You can speak to one of our Pilot Advisors during business hours at 800-854-1001 or +1-858-541-2200 or, you can email us at custserv@kingschools.com. I have used a radar for years in my aircraft. This was an excellent review of use of my equipment. Excellent Course, after 50 years of flying I still learned many things to help with my radar knowledge. Thanks King! I had to teach myself on how to use the weather radar while I was flying single pilot. I really wasn't sure if I was using it correctly and didn't feel confident in using it, until I took this course! Great explanations, simple and to the point. Now I want to go flying and try it out!